Why do Paid Content Projects Fail? Publishers are very clear about the need to become more present in their audiences’ lives, engage them more effectively and, of course, sell them more. Paid content strategies around membership and paywalls are being designed to build value direct from audience relationships. Data can be a key competitive advantage for modern media businesses if they can act on audience insights. Publishers and media organisations are well aware of the need to put their audiences first though, business demands and targets often force them into making decisions based on numbers rather than delivering value. Audiences are shifting from print to online platforms, reader behavior is changing and, social platforms are taking the lion’s share of revenue from aggregating an ocean of data. Today reader retention needs to be based on relevance and personalization instead of mass advertising. A number of US publishers have paved the way by introducing digital subscription models with great success. Publishers in Europe and the UK are experimenting with paid content models but; most are failing to see large returns. Which begs the question why? The answer is data. Knowing what data to collect and what to do with it is a big challenge for publishers. The solution is to use data to learn about reader behavior. Below we set out a sample on introducing a paid content model in stages. If publishers want to serve their users better, then believe it when we say it, data is king. Lets start with the anonymous visitor. 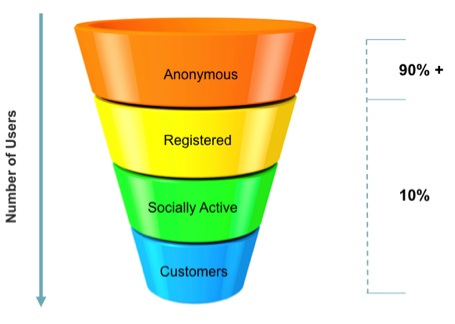 90% of traffic to a site comes from an anonymous user; this is a huge cluster of users to target. Anonymous users can be tracked using cookies and rules set specifically for these visitors in the data engine. Thus marketing activity and targeted ads for example can be applied at the anonymous stage. Once an anonymous user has started to engage, the next stage would be to prompt registration and build a more detailed profile for the user. This can be done through short, one-click instructions; avoid detailed surveys, there’s nothing worse than a lengthy form to repel anonymous visitors. Reward users with a discount, in exchange for a piece of personal information. Offer extra articles or some premium content for each piece of information they provide. Competitions or sweepstakes are a clever method for exchange of data with the user; we all love the idea of winning something! Reduce the barriers to entry; there is no need for multiple passwords across one platform. Allowing the user a single sign on not only reduces the chances of losing users but also provides an added level of security for the publisher. The number of digital properties in the press having been hacked has caused no end of financial and brand damage. Make the whole user experience simplified and seamless. Offering users the option to login through a social network allows the content provider to derive additional information about their users in order to build a more complete profile. It’s also another way of ushering users from social sites like LinkedIn and Facebook back to the publisher site. A single customer database is a must, away with data silos, third party data and, in with aggregated content and a holistic view of user data. According to Forrester, the majority of marketers have customer data spread across a surprising number of databases. Just 22% of marketers it surveyed in 2015 had a single customer database. Use customer profiles to analyze and tailor marketing and advertising activity. This can be done by defining key user segments based on profile data (such as age, gender, location, services subscribed too etc..) that can be used to further refine the experience to the user’s persona. Data can be extracted through reports for advertising inventory. Build a solid base of users through regular engagement, loyalty programs and drive conversions from anonymous users to registered users. The top 10% are regular visitors, have registered to the publisher’s site, are frequent visitors as shown by segmentation and analytics results and value the publisher’s brand. These readers are more likely to subscribe and pay than any anonymous user. Users have been so accustomed to reading free content for many years. In order to charge them publishers need to get their data right and offer a more personalized experience promoting a value exchange between both parties. Publishers need to serve both their audience and their advertisers. There has never been a more important time for publishers to clean up their data! It may be a retrospective move cleansing data and centralizing systems before erecting a wall, nevertheless it will prove a profitable exercise in the long run.